Forty new dairies will receive a total of $21.6 million in Alternative Manure Management Program (AMMP) grant awards, recently announced by the California Department of Food and Agriculture (CDFA). This was the second round of funding for AMMP, which began in 2017 with 18 funded projects. AMMP is the first climate change program in the country to provide financial assistance to dairy and other livestock producers to reduce potent methane emissions through non-digester practices. AMMP incentivizes manure management projects that reduces wet, anaerobic conditions of manure handling to dry manure practices, like solids separation, composting and pasture-based systems, including compost pack barns. The vast majority of the funded projects are in the Central Valley with the greatest number of projects in Merced and Stanislaus counties with a combined 25 projects. Four projects with take place on the North coast: 3 in Sonoma County and 1 in Humboldt County. The majority of dairy producers were funded to install manure solids separation (34 projects), reducing the amount of wet stored manure. Most projects will use more than one practice to improve their manure handling. Many combined their practices with composting of manure solids or open solar drying. Nine dairies will convert from flush (water-based) handling of manure to dry scrape. 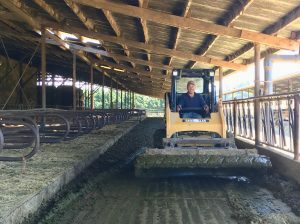 Four dairies will build new compost pack barns, which allow for cows to rest in open barns where their manure and urine are combined with dry bedding and rotated frequently to create compost. The SB 1383 work groups are wrapping up their work. The three groups were tasked with recommending to the California Air Resources Board how the state can best meet its mandated target of a 40 percent reduction in dairy and livestock methane emissions by 2030. CalCAN participates in the non-digester (alternative manure management) work group. Meanwhile, CDFA recently released a report to the legislature on its dairy methane programs. You can find that here. Among the report’s findings was that the average herd size for AMMP awarded operations was 1,943 head, compared to an average herd size of 7,430 head for operations that received dairy digester project funding from CDFA. In the coming months, CalCAN will be doing an analysis of the Dairy Methane programs at CDFA.